But Michael……Michael didn't want to. Michael, the one you're waiting for? Yes, Michael thinks the tango's hysterical. Well, I think Michael's hysterical. Don’t pay any attention to him. Would you like to learn to tango, Donna ? I'm offering you my services..free of charge. What do you say? Ah...I think I’d be a little afraid. Afraid of making a mistake. 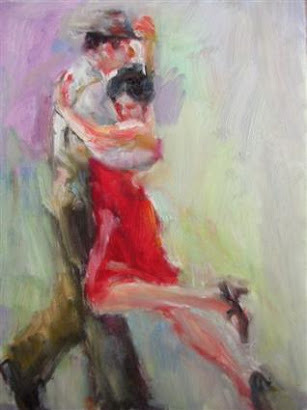 There are no mistakes in the tango, not like life. It's simple. That's what makes the tango so great. Why don't you try ? Will you try it? I used to see him every once in awhile and not yet notice him but simply because over time spent on the tango dance floor, you get to know the usual suspects. People, even odd people, marginal people which is to some extent, everyone at tango, fade into the wood of the floor. Alternatively they become tango wallpaper, surrounding until you only really notice if someone points someone else out, and then that part of the wallpaper becomes an impression who, when added to the memory of a sensational trio of dances, becomes a person. The best you can do is usually say, “Ah yes, him….the guy with the earring or her, the one with the red and black patent shoes and him, the blind guy”. The Blind Guy was actually called Michael. He blended in so well I scarcely noticed he was blind until one day I saw him arrive at tango class by cab with his dog, a black Labrador, ever by his side. 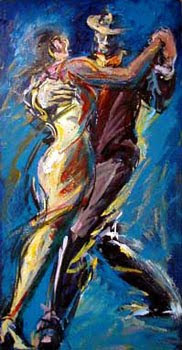 A tango dancer with a black Lab is an image one remembers. Arriving by cab is another one. Tango people all seem to walk or stroll to tango. Those who live further away bike or take the metro. I am on the short list of people that drive a Toyota and drive not from some trendy place in another part of town but simply the suburbs where the only tango is continental tango given at the strip mall’s Arthur Murray outlet. When I began noticing Michael, other tango students, noticing me notice, would whisper to me, as he carefully made his way into the room at a soiree or some other tango event, ‘Michael, you know, is quite blind but he has been coming to tango for many years. He usually takes a cab but sometimes, Micheline or Carlos brings him or takes him home at times. The dog is adorable and so patient’. I admit to being more than a bit curious about Michael, having grown up and shared my room, as a kid, with my grandmother who was also blind. As a sighted person, you get attuned, without being aware of it, in being around blind people. While it is true that they cannot see, you, for virtue of having been so much a part of their eyeless sphere, move in your own altered state ever after – well, at least, concerning the blind. At any rate, one day, one class, Michael turned up in my tango class. Tango 3. Everyone greeted him with hugs and two-cheeked kisses, as most knew him and he certainly was acquainted with all of them. Moreover, he seemed popular. His dog, Austin, lay obediently at one of the café tables his master installed him at, and gave a dog’s sigh, as he anticipated two hours of tango music. How patient he seemed! Dog and master, both entirely in black….how appropriately, how utterly tango. But it was dance time and this was a working dog, having his break. It was his master’s turn to take the floor. Austin yawned and settled in. At the switch partner time, I was matched with Michael, finally. He introduced himself to me and I found his first language was English, rather than French, which made things, at least for me, easier. “How do you do?” he said, I am Michael. The music started and we were off. Bon voyage, as we say in tango. Michael moved in a very studied, deliberate way. He held me closer than the other men, and his cues, as far as the movement of other dancers went, was different. He never, ever, once collided with another couple nor bumped me into someone else. Other dancers do; it happens - but Michael had a sixth sense about that. I began to trust him more, knowing we would be ok. Sometimes, I caught him smile as we executed one step or another without a mishap. We tried more and had more success. “Are you a dancer?” he asked. “I mean, do you dance aside from tango? I can feel it in how you carry yourself ” I was pleased he noticed and said, yes, I am a dancer. The instructor stopped the class to offer more counsel. Michael rested his hand on one of my shoulders. I learned he preferred to always keep physical contact with his partners, whether they were dancing at the moment or not. I got used to Michael’s way of leading. I never moved away from him, if we had been dancing, and there was always some part of our bodies that touched the other. Anywhere else with anyone else, Anyone else, anywhere else, that could be perceived as a pass but at dance, especially tango, it is not. Certainly with Michael it was as natural as breathing. One day I was standing near him but not too close as I was not his partner. But he turned and said “Marcy, is that you?” I said yes, and kissed him hello on both cheeks, oddly, mildly ashamed I had not made my presence known and greeted him earlier on. “How did you know?” I asked him. “Oh, that is easy. Your scent. You always smell like lilacs or lily of the valley or you have one other scent – something with jasmine and roses. It is easy to know you” he smiled, ‘even when you are steps away. I could pick you out like a flower on the dance floor, he chuckled. Ah, I thought, this is territory I know: a man flirting. I smiled. He felt rather than saw my smile and gave me one in return. Sometimes I stumbled and Michael would subtly guide me and it was an inverse – blind-man-leading-sighted-woman. When I mention Michael once in awhile to other people, they say, ah ha, just like that scene in Scent of a Woman. I want to say no – that is movies; that is Hollywood tango. At any rate, if that is an image that makes Michael real to them and inspires them to dance, that is ok. Truth is, I like Al Pacino fine but he is an actor. I bet he does not even dance, let alone tango, since he made that movie and he pretended, consummate actor that he is, to be blind. I bet he misses the dance just a bit more than all of us who mention the scene. How could he not? I saw Michael some other times after that session and occasionally I see him at tango evenings and other tango schools. I dance with a lot of men and have many other partners as we all do. When a partner of mine has a hard time or the dance floor is particularly traffic-filled, and we bump and collide with other couples, I fob it off. That is how it is handled by any of us – it happens. But inside I muse, in the kindest of ways, ‘Michael was blind and yet he guided me perfectly.“ He trusted that other dancers would not crash into him; he trusted his own dancing. He led me without faltering, out from his own inner, uniquely lit world into a dark one. Michael trusted it would just be alright. It was. And we were. At the end of the evening, other tango dancers would bring Michael a glass of water and a bowl of water for his dog. Hugs goodbye and a pat for Austin and Michael, accompanied by another student dancer, would leave. I wondered how he got home until I saw one of the other dancers that knew him well hail a cab for him outside. He got in and I assume, went home. I liked seeing the other tango dance transform from tanquero into helpmate. It showed me another dimension of them as well - the humanity part. I always remember how I liked dancing with Michael. He reminded me of that closeness of spirit I shared with my grandmother. You forget, you know – but it is a bond you have you do not know you have until you encounter another blind person. But the other thing about dancing with a blind man is another lesson entirely. The thing is, and I should know this having lived with a blind person, but more so, for having danced with one: some people just have this inner compass that guides them. You worry for them but they are, in fact, just fine. In the end, you do not always have to see to lead. You just have to know what you are about. You do not have to see to know where you are going. Tango, much like life, is about a hunch about direction. You give it a shot. Then you put one step in front of the other. From a distance, it looks like dancing. From a greater distance, it looks like a straight line. Take it one step further and it almost looks though you know where you are going. If two people do this together, in harmony – well, that is a sight to see. A blind man could tell you how incredible that is.